The Canon PowerShot A495 is an easy-to-use, entry level digicam. Featuring a 10-Megapixel imaging sensor, 3.3x optical zoom and Face Detection software, this camera is can be used by anyone, no mater how much experience they have with a digital camera. Read more in our Full Conclusion. 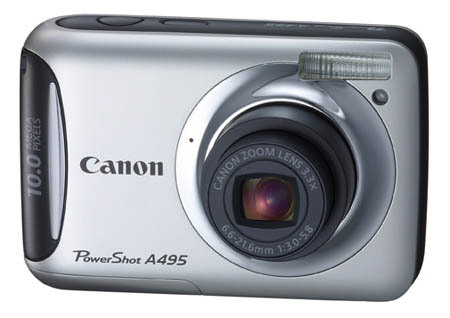 Canon's Powershot A495 is a compact, entry-level model that has been designed to be as easy to use as possible. This simple camera comes packed with features like a 10-Megapixel imaging sensor, Digic III processor, Smart Auto shooting mode and Canon's Face Detect Self-Timer; just in case you thought simple meant less. All of your framing and viewing of your images is done on the camera's 2.5-inch LCD screen. The Powershot A495 is very similar to the A490 which is also new to Canon's lineup. With just a few more features and shooting modes, the A495 gives you a little more creative freedom than the A490. One of these features is Face Detection Self-Timer, which allows the user to set up the camera for a group portrait shot, then join the group before the camera will capture an image. The camera detects the number of faces in the frame, then waits for an additional face to be detected before starting the timer. This allows the photographer to take his/her time getting into the picture.